A Follow Spot: Jumping Into June! When June hits, we usually begin to talk about summer theater options. This year, it feels a lot more like early spring around here, not summer, but I guess we'll cope. And I hope all the outdoor theater people have umbrellas! Two notes about June that are different from previous years: The mainstage plays at the Illinois Shakespeare Festival won't start till July and the University of Illinois has benched its summer rep completely. But don't fret -- you'll still find plenty of June options to entertain you. An Australian movie called The Sapphires is currently playing at Champaign's Art Theatre Co-op. Its "girl group goes to Vietnam" sounds a bit like Dreamgirls meets The Commitments meets Shirley Lauro's A Piece of My Heart, except not sad. Inspired by "an incredible true story," The Sapphires involves a girl group of aboriginal sisters from a small, remote mission town who take their act into the middle of a war to entertain American troops. 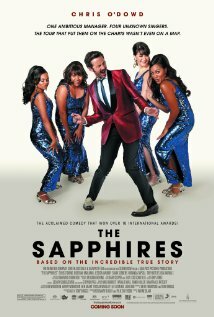 Chris O'Dowd (The IT Crowd, Bridesmaids, Family Tree) plays their well-meaning manager, while Deborah Mailman, Jessica Mauboy, Shari Sebbens and Miranda Tapsell are the Sapphires. Check out the trailer here. The Art has The Sapphires scheduled for performances tonight through Thursday at 7:30 pm. Eureka College continues the Central Illinois Stage Combat workshop through June 7, plus Eureka's new high school play competition is underway, with a July 1 deadline. They're looking for ten-minute plays written by high school playwrights, with six winning scripts to be performed by Eureka College in conjunction with the Peoria Live Theatre League. And speaking of ten-minute plays... Heartland Theatre's very popular annual 10-Minute Play Festival, this year centered on plays with packages, parcels and presents front and center, opens this Thursday, June 6, with a special pay-what-you-can preview performance. 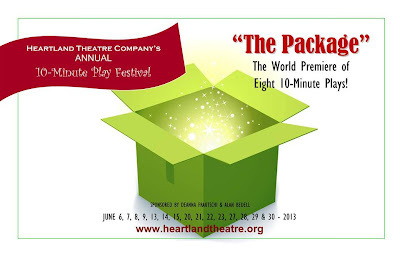 The festival continues through June 30, with all the details on the eight winning 10-minute plays here and the schedule of performances here. Call 309-452-8709 to reserve tickets. Although Macbeth, The Comedy of Errors and Failure: A Love Story don't start till July, the Illinois Shakespeare Festival will offer its Theatre for Young Audiences choice -- The Magical Mind of Billy Shakespeare, written by artistic director Kevin Rich -- on Wednesdays and Saturdays throughout June. Performances will take place either on the grounds of Ewing Manor, the Bloomington Farmers Market, Lincoln Park or the Children's Discovery Museum. The Improvised Shakespeare Company will also perform their spur-of-the-moment Shakespearean hijinks at 8 pm on June 6 and 13 in the theatre at Ewing Manor. More information on all the Festival goings-on is available here. And even though U of I is no longer in the summer rep business, Urbana's Station Theatre is. You can see Tracy Letts' Superior Donuts and something called Evil Dead the Musical this month, with performances from June 6-15 for Donuts, directed by Thom Schnarre, and June 27 to July 13 for the Evil Dead, whose spoofy musical adventures will be directed by Aaron Kaplan for the Station. Click here for all the details. New Route Theatre presents Dael Orlandersmith's The Gimmick from June 7 to 16, complete with a very nice "gimmick" of their own -- librarians and teachers get in free! New Route artistic director Don Shandrow directs local favorite Jennifer Rusk as Alexis, a young girl struggling with the life she's been handed, which includes an alcoholic mother and a very bad neighborhood. But Alexis's world is opened up by a librarian who reaches out to her. And that's why librarians and teachers get free admission to this play! The Gimmick will be presented at the McLean County YWCA located at the corner of Hershey and Empire. Call 309-660-2275 or visit New Route's Facebook page for details. Area students will come out to play at the Connie Link Memorial Ampitheatre when Normal Parks and Recreation's summer musical season begins June 13. 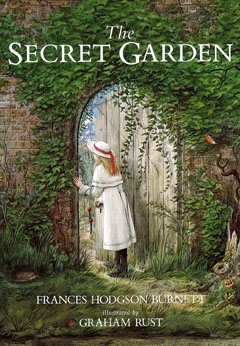 This year's June offering is The Secret Garden, a beautiful musical based on the children's book by Frances Hodgson Burnett, with book and lyrics by Marsha Norman and music by Lucy Simon (Carly Simon's sister). Normal's cast includes Caroline McKenzie as Mary Lennox, the girl who discovers the magical garden, Ryan Groves as her uncle, Archibad Craven, and Zachary Mikel as her cousin Colin. For news about Normal Parks and Rec and their summer shows, check out their Facebook page here. 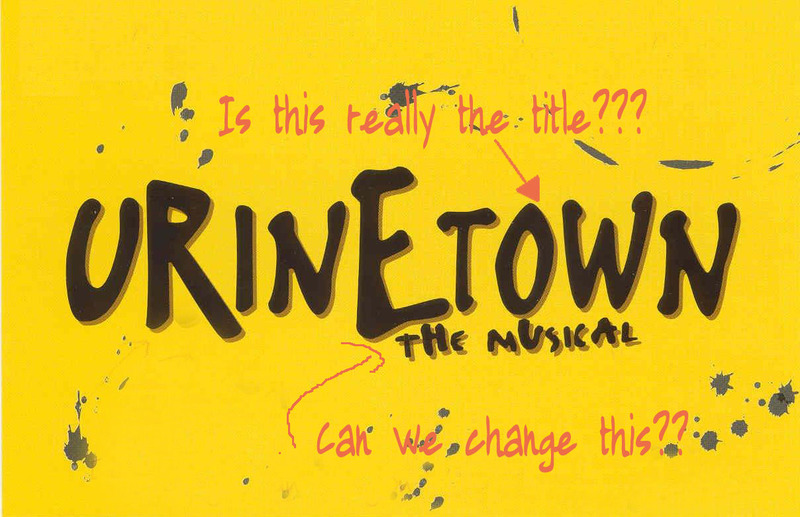 The Champaign-Urbana Theatre Company offers its summer student production of Urinetown from June 13 to 23 at the Parkland College Theatre in Champaign. Quinn Murphy stars as our hero, Bobby Strong, with Jenna Conway and Kate Meyers sharing the role of his sweet and adorable love interest Hope Cladwell. 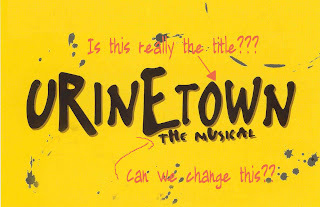 Urinetown is a very funny, very pointed satirical show, showing a neo-Brechtian dystopic world where water is scarce and "it is a privilege to pee." You can check out the whole cast list here and check in on the CUTC Urinetown blog here. Also coming to movie theaters this Friday: Joss Whedon's black and white film of "Much Ado About Nothing"! So far I haven't been able to discover exactly which theaters are participating in its "limited release"; but I'm going to keep searching.